The Russians discovered the healing power of cranberry (russ. клюква [kljúkwa]) centuries ago. In Russia this healthy berry is still often used as a base for dressings, sauces and gravies or as juice. Wash, blanch und mash cranberries. 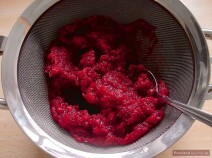 Place cranberries in the strainer over a bowl. 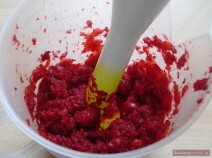 Make juice drip into the bowl, stirring cranberry mash with a spoon. Set the bowl with cranberry juice aside. 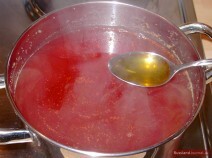 Place cranberry mash in a saucepan and pour boiling water over. Cook for about 5 minutes. 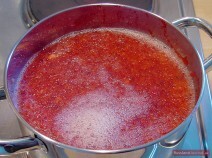 Add honey, mix well and allow to cool. 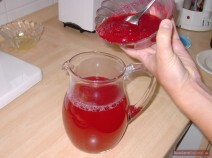 Stir in fresh cranberry juice. Serve cold. Unlike other berries, cranberry does not lose much vitamins and minerals even if stored for a long time. This happens as fresh cranberries are rich in organic acids. Such organic acids can be produced chemically and are widely accepted as preservatives for cosmetic and other products. To preserve cranberries, clean and wash them thoroughly, fill in jars, pour cold water over and store in a cool place. The temperature should not exceed 10C/50F. Cranberry can also be frozen. Cranberry does not contain as much vitamin C as black currant or rosehip, but it is rich in vitamin P which increases the absorption of vitamin C. Cranberry is a good source of vitamins A, B1, B2, B3, B5, B6 and E. It also contains lots of minerals such as potassium, magnesium or iodine. So it is no wonder that cranberry is recommended as treatment for various diseases. Cranberry is an effective cold remedy. It helps reduce fever, thirst and remove toxins from a sick body. If mixed with honey, cranberry assists in expelling the phlegm and boosts the immune system. Even those who don’t get sick often shall enjoy cranberry juice now and then. Cranberry keeps fit at work as it helps fight tiredness and activate brain functions. Especially people with high blood pressure should drink cranberry juice as often as possible. It reduces blood pressure and does not deplete the body of important vitamins like other diuretics. 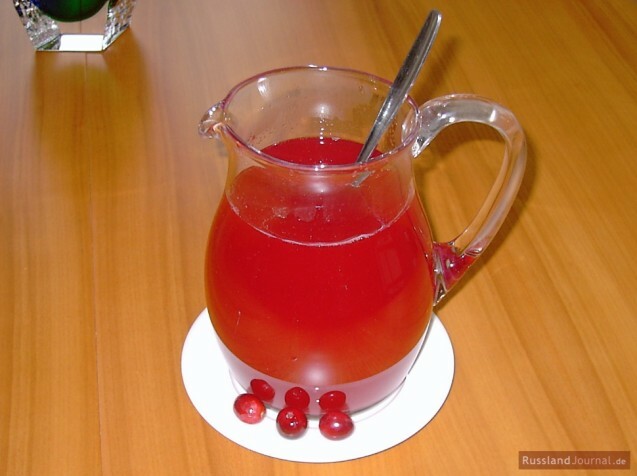 Cranberry can also prevent urinary tract infections such as cystitis. Some substances in cranberries stop bacteria from sticking to the lining of the urinary tract and bladder. And there is no infection without bacteria. Urinary tract infections are often caused by bowel bacteria which get to the urinary system from gut. And cranberry juice is the most feared enemy of harmful bowel bacteria. That is why it also helps cure indigestion. People with high stomach acid levels should avoid drinking cranberry juice, though. Cranberry juice raises levels of good cholesterol and may help fighting heart diseases. Cranberry is a great salt-substitute for those suffering from coronary heart disease or overweight. Cooking with cranberries is a great way of improving bland tastes without using much salt. Compresses made with cranberry juice treat skin diseases such as rash, itching or eczema. Cranberry also makes wounds heal faster. Frozen cranberry juice is used as a treatment for spider veins (couperose). Just freeze some fresh cranberry juice and rub ice cubes gently on the skin.